These are my memories of the businesses on the Long Hill Green from the time I was a kid in the 1930's. 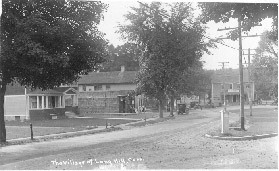 The Long Hill center was essentially the commercial center of the upper Long Hill section of town. The main business was the Center Store, which was right across from the green, between the existing green and Marisa's. The side of the store was on Main Street, but the front of the store was on the side street facing the Green. The Center store had an apartment above. Mr. George Smith and his wife lived there. The store itself had a big wooden porch on it and you walked up the stairs and there was a pay phone (which was unusual in those days) and a big soda cooler on the porch. Now the soda cooler wasn't electric. It was galvanized steel with a big lid on it and a bottle opener built into the side. Each morning Eddie Kaatz would deliver ice to the cooler. Kaatz lived on Whitney Avenue and had the icehouse there. Most families didn't have refrigerators and so he had a daily ice route. So, every morning he would come through and load a big cake of ice in the soda cooler. Now the soda cooler was always loaded with all different kinds of soda, some of which you don't have today. There of course was always Coca Cola, (in the little bottles), 7 up, Pepsi Cola, a soda that tasted just like Pepsi Cola which was called Spur, and Virginia Dare, Hires Root Beer and NeHi. At any rate, the soda was always there and the cooler was never locked, The store closed early, so if you wanted a soda after 6 o'clock at night, you took a soda. Then the next day or when you next went there, you'd say Mr. Smith, I took a Hires Root beer and here's the nickel for it. Of course in those days, people were very honest. We called the store Smith's General Store. Mr. Smith dressed like the typical grocer in those days. He always had a clean white cotton apron on each morning. It was a bib style that covered his whole front and he wore a flat straw hat. His wife worked in the store as well. As you walked into the store, on the right hand side was the soda fountain, where you could get ice cream or sodas. You could buy a Coca-Cola or you could buy Moxie. Today, Moxie is almost non-existent, I think you can still buy it in northern New England. In those days, Moxie was considered a health drink. It tasted a lot like Dr. Pepper. We rarely bought our soda from the soda fountain because it was cheaper in the bottle from the cooler. One drink you couldn't get bottled was Cherry Smash and once in a blue moon we'd go in for one. The soda fountain also sold take away things like popsicles and fudgicles. In each box there was one that was marked "free" on the stick. If you got that one, you could turn the stick in later for a free one. We used to walk up Main Street looking for discarded popsicle sticks. We'd often get lucky find one that said free and trade it in. If you walked past the soda fountain, to the left rear portion of the store was an ice box where you could buy ice. At the back of the store was the counter and behind the counter a variety of groceries. Not only could you buy groceries and meat and ice cream, but you could buy film for your camera, you could buy fish hooks (we used to fish in the Witch Hazel Pond), you could get just about anything within reason - it was a general store. To the left of the front door was the post office and Mr. Mahoney used to be the postmaster. In those days, there was no rural delivery and you'd have to go to the general store for your mail. Our address was Long Hill Village then, not Trumbull. Everybody had a post office box with a glass front and a little dial on it, like opening a safe. Our box number was 156. When you went in the store for something, you'd automatically look over and you could see if there was any mail in your box. If there was, and Mr. Mahoney was there, he'd give it to you. If he wasn't there, if he went home for lunch or something, you could open it with the combination and take your own mail. People ordered just about everything from Sears Roebuck. Now, in those days, practically everybody raised chickens to have a ready supply of eggs and meat. Sears also had a farm catalog and people ordered their baby chicks through Sears Roebuck. They came in a big very heavy-duty cardboard box. The box came with little troughs inside filled with water and chicken feed. There would be about 50 chicks in the box, all yellow ones, little bitty things. When you walked into the store in the spring, which is when you could order chicks, you'd hear the little baby chicks just peeping away. If say, Mrs. Jones had ordered chicks and they came in, but she hadn't picked them up yet, and you were her neighbor, Mr. Mahoney would ask to stop in on your way home you and please tell Mrs. Jones her baby chicks and here and please pick them up. Most people didn't have telephones, so it wasn't like he could just call and say hey come get your baby chicks. As the weather got warmer and more chicks came in, the post office would get stinky, so he wanted them to be picked up as soon as possible. George Smith was a wonderful person. To the right of his store was a house that was rented. Behind that house, actually it was on Broadway, was a greenhouse attached to the house. Now Mr. Smith used to operate the greenhouse and he would raise flowers during the year for sale and would make up corsages and such. When we were kids and we wanted to get our mother a plant for Easter or Mother's day we would go over there. We'd tell him we'd like to buy a plant and he'd ask how much you got. You'd say 14 cents or whatever you had, and he's say just right and he'd sell it to you for that. If your dad or your uncle were asking the plant would have been like 35 or 50 cents. He was always nice to us kids. When George Smith retired, he sold out to Eddie Tomer, who ran the store for quite a while. Tomer bought the business, the house next door, the greenhouse and the big red barn next to the greenhouse. That barn was full of bats. It was loaded with bats. They used it for storage. Later, Tomer bought the property where Marisa's is and opened the Hi-Way Diner. The Hi Way diner did a great business because the trucks could pull in the big parking lot. There was no place to stop for a coffee or a sandwich between the Merritt Canteen in Bridgeport and Newtown. When he built the Hi Way Diner he leased the store to a couple from Oklahoma, I think her first name was Wanda. I remember they had a baby while they were there and kept the baby in the store in an orange crate that was lined with pillows. They took out the soda fountain. After the couple from Oklahoma, the Sekeres family leased the store from Mr. Tomer. They lived on Whitney Avenue, just about halfway down the hill on the left. By then, the post office had moved up to where Irene's florist is today, up near St. Joseph's Manor. The address was still Long Hill. Eddie Tomer got a liquor license and opened a package store next to the general store. Victor Bruchac ran the liquor store. 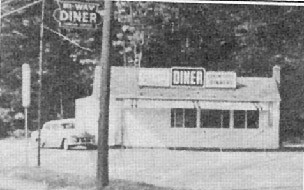 Eventually, Mr. Tomer expanded the Hi-Way Diner into a full restaurant called the Kimberly Inn. 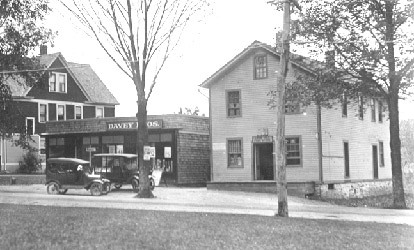 He added a building on the side and moved the liquor store there, where it remained until recently and is now the site of Long Hill Donuts. When Mr. Tomer retired, Marisa's Ristorante bought the property and remodeled and expanded again. The house next to the Center Store became a doctor's office - Dr. Austrian and Dr. Davis. When Dr. Davis left, Dr. Sherlup joined Dr. Austrian. After that it became a dentist's office. The store and home were torn down in 1974 when route 25 was being built. There was supposed to have been an exit on Whitney Avenue and the buildings were thought to interfere with the increased traffic flow. The original butcher from when Mr. Smith sold the store was Eddie from Eddie and Gene's. Eddie Tomer got a liquor license and opened a little liquor store next to the general store. Victor Brushak ran the liquor store for Eddie and Eleanor Tomer. Eventually, Tomer added a building to the side of his diner and moved the liquor store business over there. It was there until recently and is now Long Hill Donuts. Over where Luigi's is now, I'm going way back into the 1930's, there was an automobile dealership. It was a Studebaker dealership and the showroom was where the bakery section is today. It was called Bradley's Garage. Behind the showroom was the garage where they serviced cars. It has a gas pump that was just for the garage and an air hose where we would pump up our bicycle tires. During World War II, they didn't make cars anymore, so Bradley's garage ran a machine shop in the back. They had a contract with Electric Boat to make submarine parts. After the War ended, Frank Piazza bought the property and they converted it into a dry cleaners. There was a shoe repair man too. He used to sit on the cobblers' bench right in the window. You could watch him working on the shoes. Franks cleaners had a delivery service, they would come to your house, pick up the clothes and deliver them when they were done.